A few months back, I wrote a post about different types of metallic quilling paper. But sometimes, you don’t want to wait for a new shipment of paper from your favorite supplier and you want to have some glittery paper coils ASAP! So, this week, I’m sharing 5 easy ways to add some sparkle to your quilling right now! By far, the easiest and fastest way to add a metallic sheen to your quilling is to use a stamp pad. It works well on both open and tight coils and shapes. Simply place your coiled shape on your pad and press a little. The downside to using a stamp pad is that it’s pretty difficult to control exactly where the ink hits the quilling, especially if you’re not trying to cover the entire shape. There’s also the chance that you’ll end up with inky fingers. Use a pair of tweezers to place and pick up your quilling to keep your hands clean. I like using ink pens because you can put the color exactly where you want it. You can add lines or dots. Just color the outside or the center. It can be tricky to color open coiled shapes without disrupting the delicate paper, however. Maybe keep the pens and markers to tight shapes. I thought of this one when I was cleaning up the kids’ art supplies. I’ll have to admit that I’m not 100% sure what glitter glue is really used for, other than for kids’ crafts and slime. But, it brushes on quilling shapes really effortlessly and is a simple way to add a light glimmer all over. Straight glitter is for those not afraid of a little flash. It won’t really work on most quilling, but if you’re making tight coil shapes like the teardrops I used for my quilled succulents or orchids. Just a little glitter on the ends would pack a serious punch! Any glitter will do, but I really want to play with the extra fine glitter like this set below! This one is the wackiest, but it’s worth a shot! You’ll need a very richly pigmented eyeshadow and a small brush. I also found it helpful to scrap up the eyeshadow a bit if it’s a cake form. It is easier to brush on that way. Even then, the sparkle was pretty subtle, but it would be just right for those times when you need just a hint of shine. Plus, you don’t have to worry about adding any extra glue or moisture to your quilling. 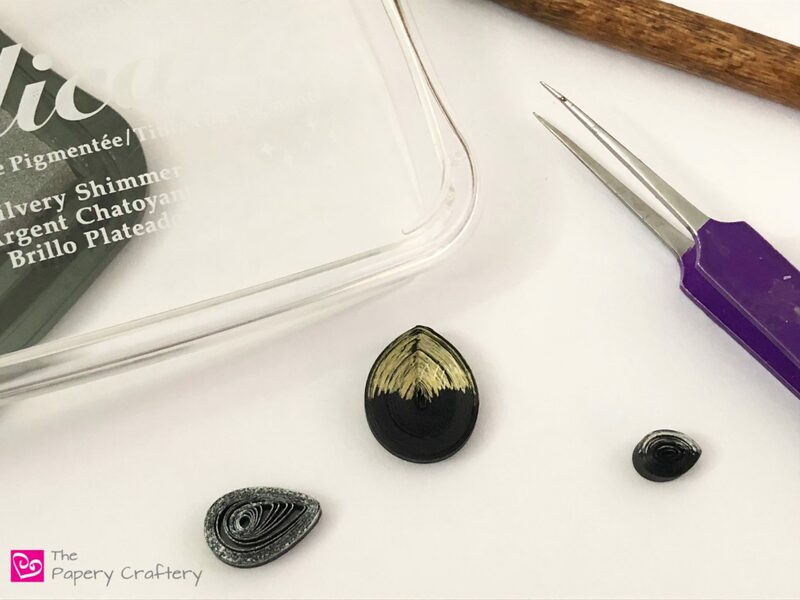 No matter how you do it, adding a little sparkle to your quilling is a fun way to change up the look of your quilling without investing in new packs of paper. And, you could use these same techniques in more ways. No matter the color, you could use ink and glitter to add dimension and details to all kinds of quilling. You could add bright color to flower petals or black dots on the back of your paper ladybugs. Have you tried any of these tricks to add sparkle and shine to your quilling? Leave a comment to tell me how it turned out! I’m glad you’re inspired to try it! Let me know how it goes. Wow, this is so beautiful! I have never given anything like this a try before, but I am super keen to now – you are talented! Thanks so much for your kind words, Alexandra! Hi there! I am loving your site so much since I just barely started quilling as a new hobby! I have a question, I love making sparkly things and was wondering if there is some type of clear spray that you could use to adhere the glitter(or sparkly loose eyeshadow, I have some old pretty ones I’d like to try!). Or if there is a spray protectant that could be used as a two in one adhesive and protectant? Thanks so much for the ideas! Hi Sheryl! Great question. Whenever I get asked about sealants on quilling, I refer back to Honey’s Quilling, because she’s done loads of research on glues and sealing quilling. I think using a spray sealant to keep light shadow could work since it’s made to keep pastel or charcoal in place. But I would test it first on some scrap paper to make sure it doesn’t change the color after it dries. Please let me know if you try it! I will look into that and try it! Thanks!